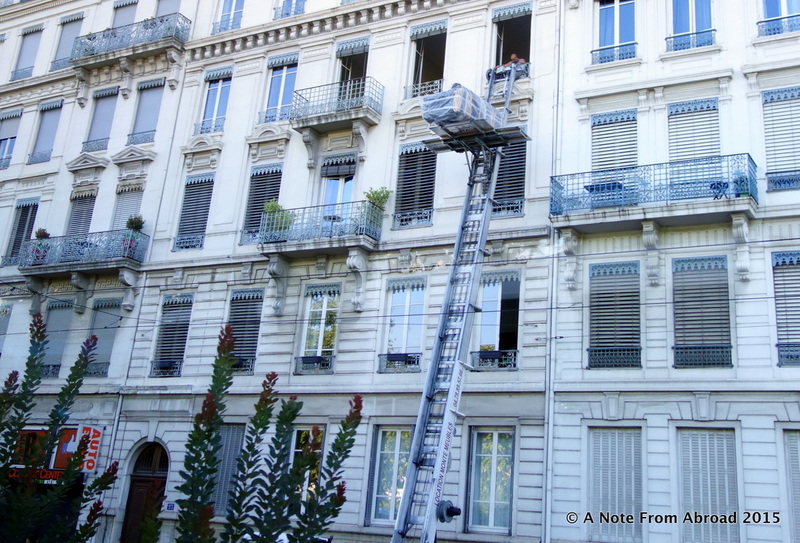 Sitting on the confluence of the Rhone and Saone rivers, this is a tale of two contrasting sides of one city. History and ancient architecture dating back 2000 years to the days of Julius Caesar, Lyon has a flair and style all of her own. 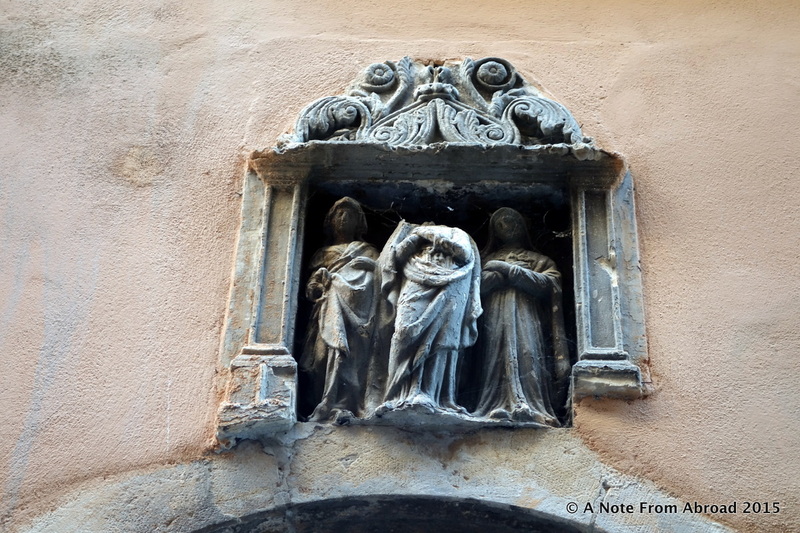 Hidden narrow passages (les traboules) allowed artisans to travel across town keeping their silk dry, unpretentious eateries (bouchons) originally established by the town women to feed hungry workers and thriving gourmet markets. Normally joined at the hip, Tim and I parted ways this morning with him choosing to do an active bike riding tour of the Lyon Peninsula with our friend Nelson and his daughter Tiffany, while I did a walking tour through the old city. I think I would have loved doing the bike ride, but I am still a little unsure of my balance and to put it to the test on a strange bike, on unfamiliar terrain with a group of people just did not seem like the wisest thing to do. Both tours departed the ship just after 9:00 am and we planned to meet back up on board at lunch around 12:30. I took a lot more pictures on my morning expedition. The character and charm are not lost on me as we wander down uneven slim streets with beautiful buildings on both sides. Similar to other historic European cities, the stairs are narrow and impossible to carry large pieces of furniture to the upper floors. In Amsterdam, we saw the large pulley and hoist system attached to the outside crown of each building. Here, we saw an updated lift to accomplish the same task. If you would like to read a bit more about the Huguenots, you can click here. 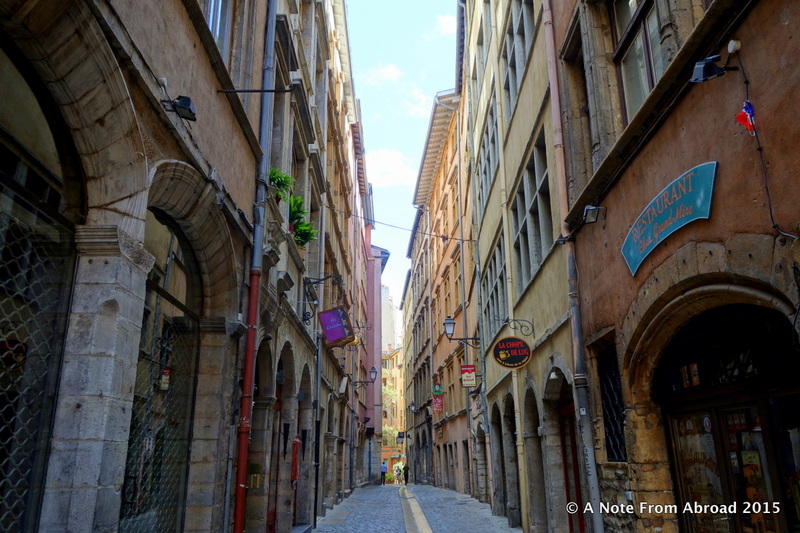 One of the most interesting aspects of Lyon were the narrow passageways, or traboules. Most of these are private property, requiring a key to access, but a few are open and available for us to view. 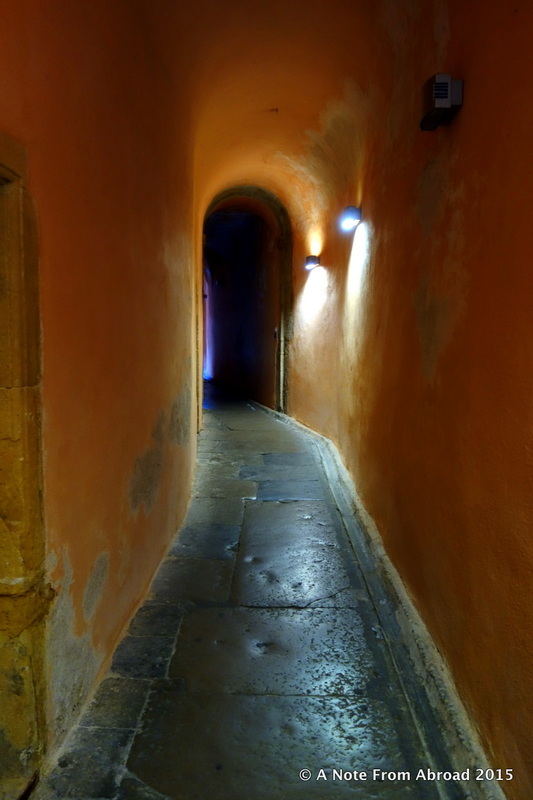 After walking partway through the passageway, you might find yourself in a charming 16th century courtyard. Well worn steps that show their age, a well in a corner, large wooden doors, hanging baskets of flowers or creeping vines, and curved architecture all added to the ambiance. Back on the main streets, we came across a few more items that caught my eye. And the last stop of the morning was at the famous Les Halles de Lyon Paul Bocuse. Now I don’t know about you, but strolling through a large gourmet marketplace that offers up fine cheeses, sausages, poultry, fish, chocolates, and a wonderful assortment of other goodies will either make you hungry or curious to try the unique specialties. 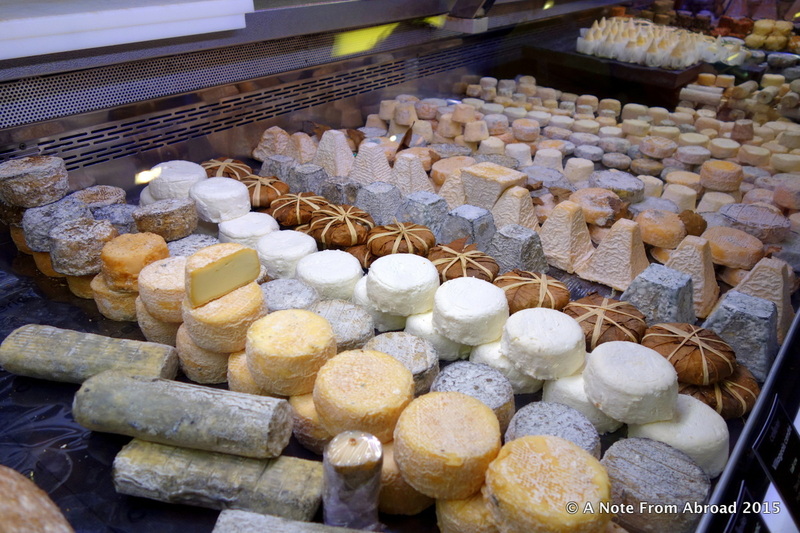 Lucky for us we had the opportunity to try several exceptional cheese varieties. As pre-arranged, I met Tim back on the SS Catherine for another delicious lunch. He enjoyed the morning bike ride tremendously and decided to join another group on an afternoon ride while I relaxed on board. Here are a few snaps from his afternoon ride to Parc de la Tête d’Or. The park was enormous with a lake, four rose gardens, huge greenhouses, a botanical garden, a zoo and a velodrome. A lovely bike path wandered around the park. There is also a legend saying that a treasure with a Christ’s head could be buried in the park. A variety of activities were in full swing including family gatherings for a birthday party or picnic, soccer games, rowing a boat on the lake or simply enjoying nature and the beauty of the park. There were no cars other than park vehicles which made it more pleasant for those walking or riding bikes. Gratitude Moment: Today I am grateful that Tim and I have the luxury of doing most things together. As much as I enjoyed the walking tour, I found it amused me how often I looked for him in the crowd. He is usually right beside me, ready to take my arm when we walk over uneven cobblestones, steady me up a flight of stairs, help watch for traffic when we cross the street, and all those many things that a gentleman does for his lady. We love hearing from our friends, old and new. There is a comment section at the bottom of this page. Leave us a note, or just say hello. Feel free to like and share us on Facebook or Twitter. We are excited to have your company! 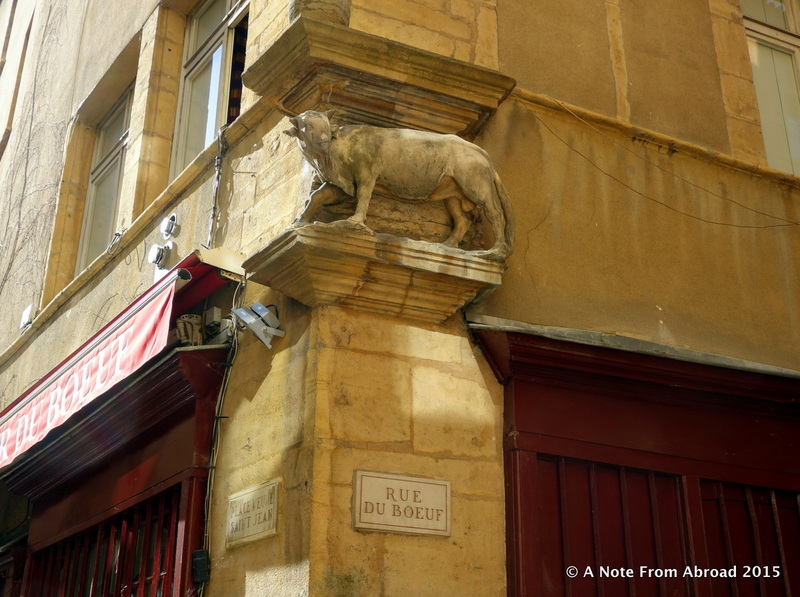 This entry was posted in Europe, France and tagged bouchons, Cruise, France, gourmet markets, Lyon, Photography, Rhone, River Cruise, Saone, traboules, Travel, Uniworld. Bookmark the permalink. Great post! 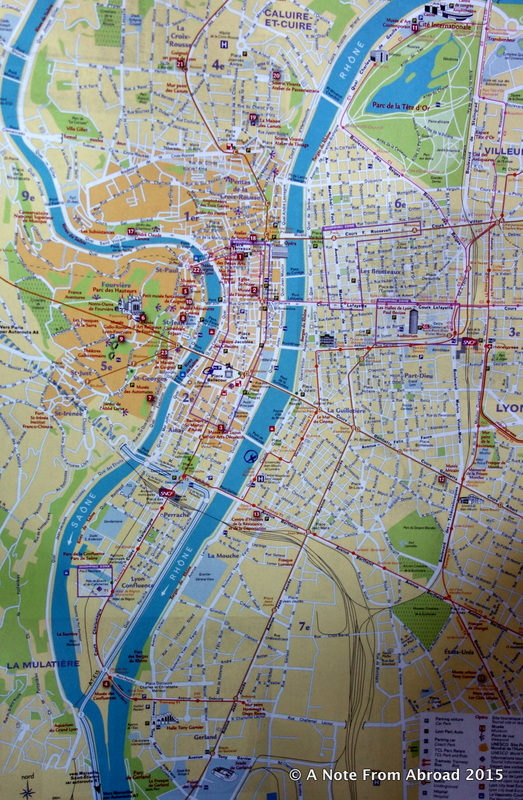 Lyon has been on my list for a long time. Very fun to read about your adventure there. And how lucky you are to have Teton NP in your back yard. Still on my wish list and hoping to get there and Glacier NP next year. Let me know if you are coming to town! Even if I am not here, I would love to share some inside info! Thanks for the offer. We would appreciate an insiders input! You’re killing me here. If I only had the resources to jump on plane and go. More than anything I want to visit the traboules. How awesome are they! Plus the narrow streets that I can’t help but love. Doug, I wish you all the best in making your travel dreams a reality. I have not always been able to travel like this, and am ever grateful that today I have this amazing opportunity. I only drive through once and was never able to stop. Looks interesting! Love those street scene photos. Lyon displays its charms in those shots. Thanks for taking a look at our blog. We always enjoy the company! :O) I look forward to seeing more. Another beautiful post of a lovely place. Thanks for sharing your travels.